Passenger vehicle (PV) sales in India advanced by only 2.7 per cent in 2018-19 (the financial year ending March 31) over 2017-18, the Society of Indian Automobile Manufacturers (Siam) said. This growth, slowest in four years, came on the back of tepid dispatches in the March quarter as consumer sentiment took a knocking, owing to uncertainty ahead of the general election. Automobile companies in India count dispatches to dealers as sales. Siam expects 2019-20 to be muted for PV sales and to end the year with five per cent growth over FY19. Historically, passenger vehicles sales have been in a slow lane in election years and revived thereafter. Growth was flat in 2009-10 and fell six per cent in 2013-14, Siam said. Two-wheeler sales rose nearly 4.9 per cent to 211,81,390 units in FY19 from FY18. Those of commercial vehicles grew 38 per cent. Weak macro economic indicators have also deterred buyers. Last week, the Reserve Bank of India cut its earlier forecast for the country's economic growth to 7.2 per cent, from 7.4 per cent. It blamed a loss of momentum in global economic activity, as well as weakening domestic investment. The economy decelerated to a five-quarter low in the December quarter, to 6.6 per cent. This led to the Central Statistics Office trimming its 2018-19 forecast to 7 per cent, from the 7.2 per cent estimated earlier. The month of March saw domestic PV sales fall nearly three per cent, to 291,806 units from the year-ago month. It was dragged down by a 6.9 per cent year-on-year drop in car sales. 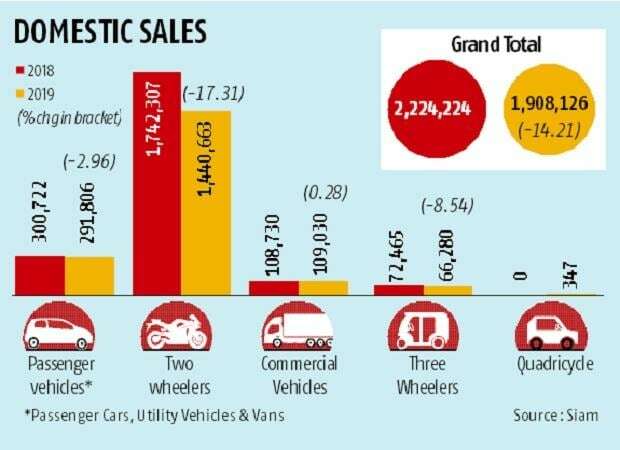 Total two-wheeler sales in March fell 17.3 per cent to 14,40,663 units over the year, as high levels of unsold stock prompted companies to cut back on deliveries to dealers. Tighter lending norms by financiers, coupled with an increase in insurance premiums, dampened buyer sentiment. Sales of commercial vehicles rose marginally to 109,030 units in March against the same month a year ago. 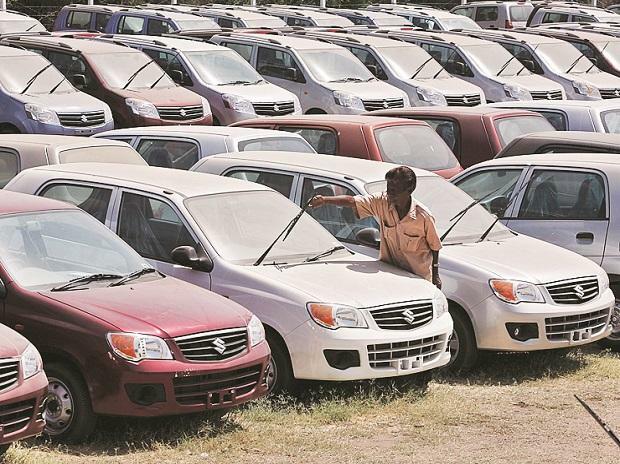 Vehicle sales across categories fell 14.2 per cent in March to 19,08,126 units from March 2018, Siam said. “In FY20, while overall demand for vehicles will remain tepid in first half of FY20, a likely rise in vehicle prices from FY21 onwards due to BS-VI implementation will prepone buying, thus boosting demand in second half of FY20. As per industry estimates, post BS-VI implementation, the cost of PVs and 2Ws is likely to rise 10 per cent-15 per cent The cost of a diesel variant PV and a CV may increase by 20per cent-25 per cent,” Bulani, senior analyst, India Ratings and Research.